Elaine's Creations: BUY 3, Get One FREE!! Stamp Tutorials & Online Classes for Sale! BUY 3, Get One FREE!! Buy 3 Designer Series Paper and get one FREE!! 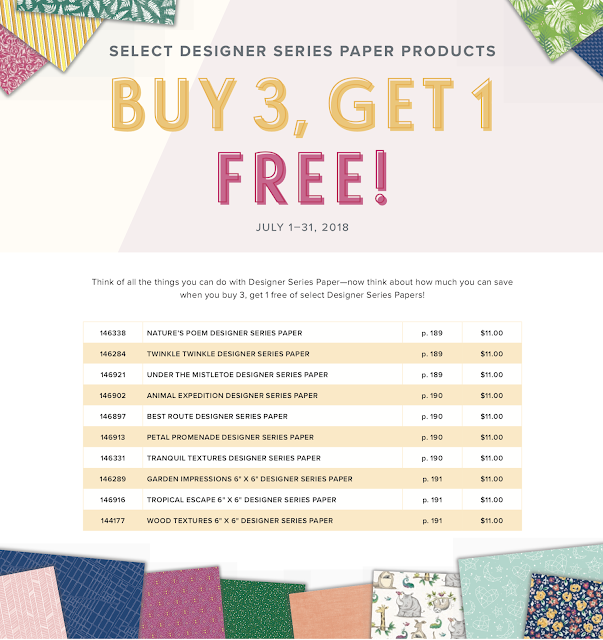 Click on pictures below to order your Designer Series Paper today! Only until July 31st! Use hostess code 9MQ43SMU and I'll send you a free gift! Get 50% off your first month of Paper Pumpkin! WOW! Amazing Deal!! Get 10 FREE Ink Pads! The contents of this blog (including text, photographs, and design work) are Elaine's Creations©. My artwork is shared for your personal inspiration and may not be copied for publication or contest submission. Thank you for respecting this. As an independent Stampin' Up! demonstrator, the contents of this blog are my sole responsibility. The use of and content of the classes, services, or products offered on this blog are not endorsed by Stampin' Up!